Though your roof is something you hope not to think about too often, noticing other problems in your home may direct you towards having to think about it. These other problems may indicate damage to your roof. Things like water stains may require you to call your local Dallas roofing contractor. Make sure you know what kind of things to look for. What can make a leak especially difficult to locate is the fact that water doesn’t necessarily drip straight down. It can travel along roof panels or lumber in the attic before dripping onto your insulation and leaving the telltale yellow water spot on your ceiling. That means the leak can be far away from where the ceiling shows damage. Unless you have good detective skills when it comes to roof leaks, you’ll want to enlist a roofing contractor to help track down the cause of the problem. 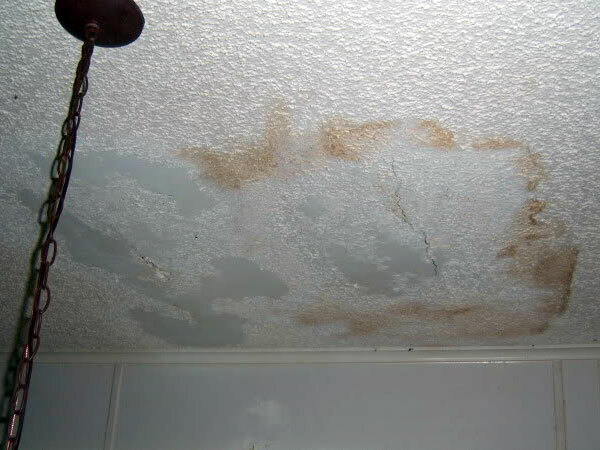 Crowe points out that water spots on the ceiling don’t automatically mean the roof is leaking. “It could be caused by windows, condensation, plumbing, or even condensation on the plumbing pipes,” she says. However, if the spots only appear, darken, or grow in size after it rains, the roof is likely the culprit. What the Roof is Trying to Tell You: The shingles are deteriorating or reaching the end of their lifespan. “Granules do come off, and they do collect in the gutters,” Crowe says, adding that some loose granules are not necessarily a cause for concern. However, if you suddenly notice a lot of the granules flowing out of the downspouts every time it rains, the next step is to get on a ladder and examine the shingles to see if they look “exposed” because most of the granules are gone. Granules protect against the sun’s UV rays, so once they’re gone, the shingles can become brittle. In extreme cases, shingles can have smooth or bald spots where all of the granules have completely fallen off. Losing the granules often means the shingles are old. “The shingles are aging,” Crowe says. “They’re near the end of their service life.” And that means you’ll need to replace them. Before you start the project yourself or call a pro to get a quote, Crowe recommends calling the manufacture to see if the shingles are still under warranty. What the Roof is Trying to Tell You: The attic may not be properly vented, and you might need to reshingle. When shingles get old and worn out, the ends sometimes start to cup—the corners turn up or the shingles look wavy. An attic that’s not vented properly can exacerbate this problem. If the attic gets too hot, it can heat up the roof, which consequently heats up the underside of the shingles. The heat can cause the shingles to age faster and start to cup. Eventually, that can allow wind-blown rain to work its way under the shingles and leak into the house.